I can not adequately describe how giddy this photo makes me. You counted correctly, there are 14 pseudo-chapter books in that photo. It's true. I have a sickness and am merrily passing it along to my daughter. I l-o-v-e love the library. We also discovered books on tape. Or CD. Or whatever. I can already tell this section of the library will be a fast favorite! I don't really know why we never investigated this area before, but sadly we did not. We immediately started listening to Junie B. Jones on the ride home and Annelise was entranced. I can't say I'm impressed by the author's obsession with using words like stupid, dumb, hate, funner and bestest, so we shall see if Junie B. ever visits again. The narrator is great though and Annelise is really enjoying listening (and has promised NOT to start talking like Junie B. in the slightest manner). For a read-aloud we checked out Charlie and the Chocolate Factory (also making a promise of a movie day to watch the Willy Wonka movie--the Gene Wilder version, not Johhny Depp though). I also went a little literary crazy. Thanks to the Goodreads iPhone app. I was able to browse my to-read shelf and then wander the library aisles with purpose. I think we floated out of the library. Well, in all honesty our bulging tote bag kept us somewhat grounded. Do you listen to books on CD? Any suggestions for children's must reads? Wow, those pictures are delightful to me, too! I'm going to have to come back and write down those titles. Max loves Nate the Great on CD and Adventures in Odyssey "Gold Audio Series"
oh boy! 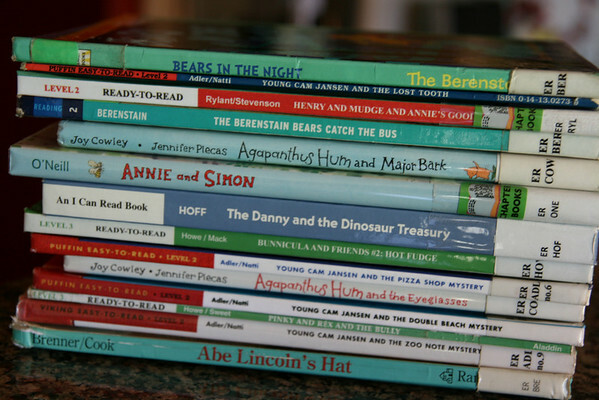 Berenstein Bears, Henry and Mudge, Danny and the Dinosaur!! FUN!! and YAY for books on tape. 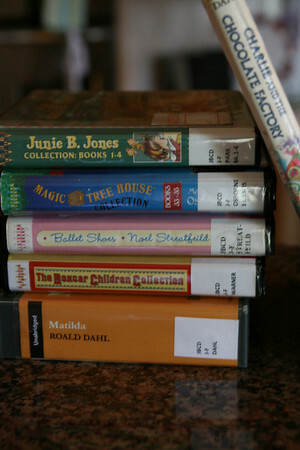 those are great ones (well, don't know about Junie B., but the Boxcar Children and Magic Tree House, yay!) Charlie will be fun too, especially followed by the movie. and what is the Lost Summer of Louisa May Alcott? sounds interesting. I am reading Phantom of the Opera. just finished Great Expectations. I actually really liked it. Hi, Holly..I am Heather's aunt and I love reading your blog. I decided to "come out" and comment because I LOVE to read. Totally an obsession. They know my number in the library and don't even ask to see my card. ha! Keep showing book ideas; I need something new to read. Your little girl is precious and I love it that you are modeling great reading. I am a kindergarten teacher; I, too, gave up on Junie B. I hate the language! Have a great summer! These are all happy pictures! 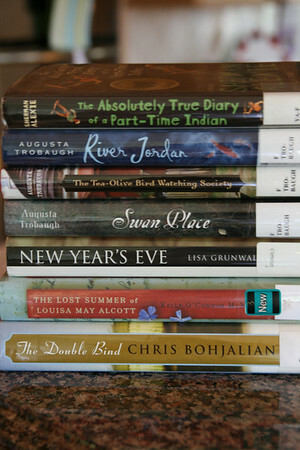 I love the library and really love having a stack of books waiting for me. I'm a bit envious of your iphone and Goodreads' app because I never remember the titles of the books I have on my to-read list! Anna: We may check out Nate the Great on CD too. I was SO excited to see so many choices available at our library and am kicking myself for not browsing that shelf earlier! Silken: Annelise liked Junie B., but I don't think we'll get her again--there are many better choices out there that don't mangle the English language and use stupid and dumb 8000 times. I haven't been brave enough to read Dickens--yet. Glad you liked it. I just quickly glanced at the write-up for the Louisa May Alcott story, but it's based (from journals and letters) on the summer Louisa met a man named Joseph Singer. I'll let you know how it turns out. Jody: So happy you came out and commented! :) I'm obsessed with books too and feel happiest when surrounded by them. Jill: I always forgot too or would carry scraps of paper with book names or author names, so I'm really happy to have that app. now. As a Kindergarten teacher I would love to suggest some great books. Henry and Mudge (saw that in her stack) is great and that author also wrote a series called "Mr Putter and Tabby" and "Poppleton." They are great. This is a great book to buy that gives you a very complete books that kids should read. It also breaks it down my reading level and tells a little bit about each book. http://tinyurl.com/2dtvgj6 A MUST have. We use ours all the time. I am going to make a list and comment later if that is ok.